So you’ve thrown out your vinyl shower curtain and only buy fragrance-free cosmetics to avoid phthalates? Bad news – toxic plastic chemicals are still sneaking into the food you eat. Phthalates are industrial compounds used to make vinyl plastic malleable, and are also used as fragrance solvents and fixatives in body care products. They’re potent hormone disruptors. They can alter the reproductive development of male infants and are associated with sperm damage in adult men. Children exposed to phthalates in early life can undergo behavioral changes and develop allergies. Scientists have detected phthalates in many types of food. They have found particularly high concentrations in dairy and meat. These man-made compounds may contaminate food during processing or packaging, presumably from contact with polyvinyl chloride, or PVC, plastics. A study by Ami Zota and colleagues at George Washington University, published last April in the journal Environmental Health Perspectives, found phthalates in nearly all of the 7,000 Americans tested. More specifically, they found higher than average levels of two phthalates – di(2-ethylhexyl)phthalate and diisononyl phthalate – in those who reported eating fast food within the past 24 hours. The study did not say exactly how fast food was tainted with these chemicals, but suggested it happened during preparation – for instance, from contact with PVC gloves or plastic packaging. It’s almost impossible to avoid eating phthalates. In 2013, Sheela Sathyanarayana of the University of Washington studied whether reducing processed food intake could decrease people’s exposure to phthalates and another endocrine disruptor, bisphenol A, or BPA. Her team provided five volunteer families fresh, local, organic and chef-prepared meals. Surprisingly phthalate levels in the participants skyrocketed to as much as 100 times the typical level for an American adult. The researchers found elevated levels of phthalate in dairy products and even higher concentrations in organic cinnamon, cayenne pepper and coriander. Sathyanarayana concluded that only government action could reduce Americans’ exposures to phthalates in foods. FDA rules allow phthalates in foods as “indirect additives,” such as accidental contaminants transmitted via food processing and packaging materials. Manufacturers could also add them directly to food, under rules that allow food companies to determine for themselves whether an additive is safe. Environmental advocates have petitioned the FDA to end the use of phthalates in materials that commonly contact food. This includes plastic gloves worn by food handlers, plastic tubing used to process milk and other liquid dairy products, and plastic food packaging. 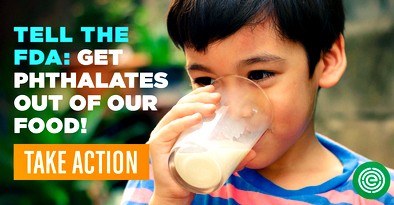 Tell the FDA to take decisive action and remove phthalates from food.